Hello and belated New Year greeting!. Apology for neglecting the blog again for many weeks, I had disappeared to California enjoying the sun and hopefully has escaped the worst of English winter. Chinese New Year is coming soon. This year is the year of the rabbit and 1st day of CNY is next Thursday 3rd Feb.
One of my CNY favourite snack is sweet bbq pork from Singapore (and West Malaysia too). 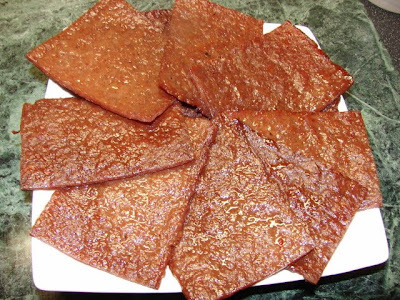 Anyone who lives or had visited Singapore will be familiar with the bbq smell on the street or shopping centres when the bbq meat store's vendor grilling this yummy red thin pork slices right outside the store attracting customers. With the strict custom restriction banning meat imports, it is quite difficult nowadays to bring this goody from the Far East. I have a friend in Canada who can make this sweet bbq pork just like the real thing from Singapore but he is reluctant to share the recipe. I have been searching for a decent recipe for a while and non has caught my eyes. Most of the recipes I've found dries the pork at a fairly high temperature between 100 - 125 deg C. This will cook the meat right away rather then drying. Some have use red colour to make the meat looks red and I am one trying to steer away from artificial colour much as I can. 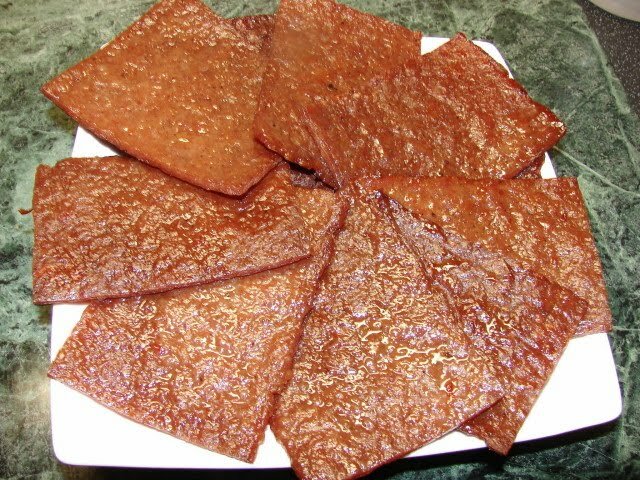 Having made bacon and lap cheong previously have given me the idea to use curing salt to cure the meat and giving it a deep red colour. Without a T&T recipe, I used my lap cheong recipe and modified it to concoct this sweet bbq pork recipe. I used standard ground pork from the supermarket and #1 pink cure salt because the meat does not need to cure longer than 24 hrs. It's a cheap and cheerful experiment well worth trying. 2.5g (about 1/2 loosely packed level tsp) #1curing salt (#1 Prague powder/ DQ curing salt/ pink cure salt), concentration is 6.25% nitrite, if using different concentration salt adjust accordingly. Mix and stir all the marinating ingredients together. Mix thoroughly with the meat. Best use hands and wear disposable gloves if you don't like to touch raw meat. Cover and keep meat in the fridge overnight. Cut several pieces of parchment paper/ greased proof paper about the same size of your oven rack. Place one piece of paper on the working area. Brush lightly with cooking oil. Divide the meat into 2 - 3 portions. Put one portion of meat on the oil greased paper. Spread the meat with a wooden or stiff plastic spatula, to about 1/2 thick. Oil grease another piece of paper same size. Place this (grease side down) on top the meat. Press the meat with hands and/ or with a rolling pin, spread the meat evenly and thinly to about 2 - 2.5 mm thick. Tidy the edges much as you can. Peel of the top sheet of paper. Once done put this aside. Repeat step 7 - 9 till you have 2 - 3 very thin sheet of meat on paper. I have divided the meat into two portions, size of each sheet of meat was about 40 x 25 cm. Put the sheets on oven racks. Turn the oven on to about 60 - 65 deg C. Dry for about 1 hour - 1hour15min by which time the meat would have set, shrunk 1 - 2 cm on each side, getting slightly thicker, feels quite greasy on the surface and the meat feels like a soft piece of rubber. During drying time, open oven door every 15 - 20 min during drying time to release steam. Take the meat out. Flip the meat directly onto the rack and remove the paper. Return to the oven and continue drying for another hour or a bit more, by which time the meat should be quite rubbery. Also open oven door every 15 - 20 min to release steam. Let the meat cool down. Then cut into pieces. They are now ready to cook - grilled/charbroil, chargrill or bbq. If you don't want to cook it right away you can store them in the fridge after drying, keeps for a week or keep in freezer till you are ready to cook and eat. To grill or charbroil meat, turn the grill (charbroiler) on high. Take a baking tray (baking sheet), put a rack on top then put the meat pieces on the rack. Grill (charbroil) for about 60 - 90 sec on each side till you see lots of fat bubbling on the meat surface and slightly charred. Turn over and grill (charbroil) the other side. Take them out and cool on kitchen towel to absorb some of the grease. There will be quite a bit of fat collected on the baking tray. Amount of fat depends on fat content of the meat. Once cool enough to touch it's ready to eat or store in container. Will keep for about a week in the fridge. Can refresh by microwave for few seconds. * greasing the paper helps the meat not sticking to paper. Though parchment paper is non stick but raw meat will stick to parchment paper. The result was pretty good. The meat is quite red like it should be. Flavour and texture quite nice, the only downside is the lack of smoky flavour. I will definitely try again and cook them on charcoal bbq when the weather gets warmer. Other than eating this bbq meat on its own as a snack, it is great sandwiched with soft bread. If anyone wants to buy some curing salt I have plenty, you can contact me by email. this looks really good. tks for sharing. Finally you have updated your blog. Enjoy reading it. the recipe is v. long-winded which is daunting for me to make. one day, i shall find the time when i set myself a day to it. i do love HK pork jerky when my mum brings some back (she sends it by post and seems to get away with it), but last year or so, she's bought individual bize-sized pieces that are cellophaned=wrapped that come in a variety of different flavours. take ages to unwrap and you need at least ten or so, to satiate your appetite! shop-bought jerky in the UK is never the same as the ones in HK. they're usually from other countries where the meat is a lot tougher and the flavour not quite sweet enough. i love your blog btw. i've made a couple of dishes - lo mei gai (success!!! ), mar lai goh, and beef rendang. the sponge was really horrid and stodgy, and the rendang wasn't really spicy or well-flavoured enought.. sorry! but keep your delicious recipes coming, sunflower. you're the only blog with really authentic flavours of my childhood dinners at home...! Re Mai Lai Koh and rendang, fair comments. Ma lai koh, is your bicarb active and did you steam at the highest heat? I don't think electric steamer is strong enough to give the maximum boost to fluffiness. Rendang, how spicy do you like? Did you add the maximum amount of dry chillies and if your fresh chillies and dry chillies the mild or hot? Did you stir fry the spicy paste long enough till red oil is separating. Strangely I made Rou Gan for the first time this festive season as well. I have used this receipy and it is not too bad as well, i give it an extra coat of honey towards the end to give it a nice glistening look. I also find that supermarket mince has lots of water. I order it in from a good butcher. Supermarket ground pork is not excellent but ok for this recipe. I don't use it for making lap cheong. Forgot to mention to use Magic non stick liners which the meat doesnt stick to. As i find removing the grease proof paper a chore. What is curing salt and what do you call it in Malaysia. Although it is openly sold everywhere in KL, but I don't fancy buying them during the New Year time because the texture is always hard and dry. I wonder if they did it months ahead. Cure salt is similar to saltpetre (potassium nitrate). There are 2 types of cure salts, one with nitrate and another with nitrite. Cure salt is a mixture of common salt with traces of nitrate and/or nitrite salt. They are much safer to use than pure saltpetre. Saltpetre is very concentrate only need very minute amount, excess can be poisonous and harmful to health. 1. Turning the meat pink and not grey when cooked. 2. Cure the meat to give it a cured flavour. 3. Acts like a preservative, preventing growth of bacteria that can cause botulism, especially meat needs long time to cure like air dried ham, salami and sausages. I am not sure you can get cure salt 1 and 2 in Malaysia, but you can get saltpetre in Chinese medicine store called 钾硝. I don't recommend using saltpetre it's too concentrate and can easily go over allowable limit. Isn't the nitrite in curing salt more harmful than food colouring? You may be right, but I have no problem with using nitrite. Nitrite is used in most processed meat. If you want to avoid this, choice is yours. It's your choice too but you should not advise your readers that curing salt is more healthy than food colouring without warning them that nitrites cause cancer in animals. That's my comment, which I'm sure you'll delete. If you think I am going to delete your comment don’t post it. I stand by what I said about my preference of nitrite salt than colourant, you don’t have to take my word. If nitrite can cause cancer so easily, think of how much commercial cured meat is consumed daily in the world, these people would be dead or suffering from cancer. Moderation is the key. I wrote this blog for interest if you like it thank you, if you think it’s crap don’t read. I don’t write to ensure your health and safety. Thank you very much. I wish you health next time you eat some bacon, ham or other cured meat. Hi, I'm interested in getting some curing salt from you. Please can you contact me at 98893541? I have been looking all over for this salt. Sorry I don't know what country you are from you can contact me by email check email listed on blog.